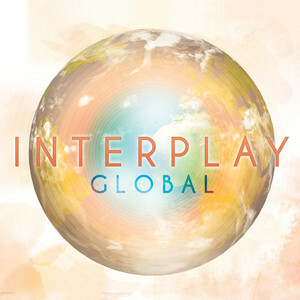 A VERITABLE CORNUCOPIA of musical influences colour the jazz of this lively second release, ‘Global’, from Midlands-based quintet, Interplay. From the outset, it’s clear that this five-piece’s intent is to offer a programme of upbeat, diverse and accessible jazz – the established line-up of Alan Wakeman (reeds), Richard Baker (trombone), Neil Hunter (keys), Adrian Litvinoff (bass) and Dave Balen (drums) presenting no less than eight impressive Litvinoff originals, as well as their own interpretations of favourites from such luminaries as McCoy Tyner, Abdullah Ibrahim and Pat Metheny. At the heart of the playlist, Litvinoff’s raga-style Weightless conveys the cosmopolitan flavours to be found here, Dave Balen’s beautifully-weighted tabla producing a mesmeric rhythm from which Alan Wakeman’s gentle, keyboard-backed soprano flows so freely. Autumn Magic is a breezy outing (though also with a darker, pensive look towards Winter), illuminated by Wakeman’s bright shining flute and Richard Baker’s nimble-yet-smooth trombone soloing. Fashion Statement indicates more of a fusion feel, due to its strong organ/synth presence and composer Litvinoff’s electric bass, whilst Su Baille Nuevo dances spiritedly to a mid-tempo flamenco rhythm which increases in intensity as Baker and Wakeman improvise off each other. Slow Flame, an ’80s creation of Litvinoff’s, finds Alan Wakeman carrying a luscious tenor line over sensitive piano, bass and drums – Baker’s fluent trombone soloing, too, is a delight. In contrast, the quintet gives added vigour to Abdullah Ibrahim’s Imam, soprano sax, trombone and Egyptian tabla a great combination over a harder-edged electric bass ground (perhaps shades of Gilad Atzmon, and very effective!). Neil Hunter’s electric piano on Swift Return provides a cheery, retro-felt samba, Wakeman’s flighty flute enhancing Litvinoff’s first-sign-of-Summer inspiration. The Cuban All Star Band’s classic Amor Verdadero takes on a higher-energy tempo here, driven along by drums and congas, bristling Latin piano from Hunter and a strong pairing of trombone and tenor. The quintet’s arrangement of McCoy Tyner’s Contemplation sounds particularly fresh with Baker’s sonorous trombone lead, rich tenor soloing, and lavish major/minor piano that its composer would be proud of! Adrian Litvinoff’s acceptance of older age (by his own description) brings warmth and charm to Elders, a gentle, classic-sounding number which includes the clarity and lightness of his own double bass soloing. Shapeshift skims along gleefully to Balen’s and Litvinoff’s up-tempo rhythm, tenor sax and trombone gliding above Hunter’s expert organ and piano work; and Pat Metheny’s Hermitage (sans guitar) eases us out pleasantly with it’s mellow, homely and easy-going nature. Interplay have developed a reputation over the past few years for bringing contemporary jazz to a wider audience, performing live at numerous gigs, festivals and community events. ‘Global’ pulls together the band’s considerable combined experience (their individual CVs are pretty staggering!) to create this joyful and contrasting studio recording.